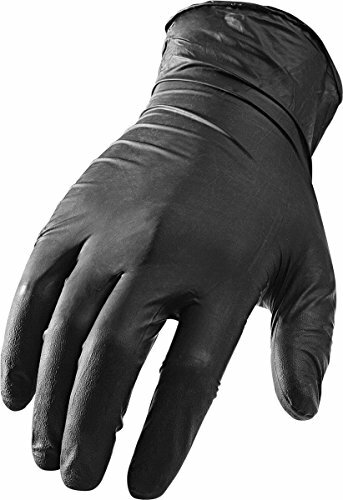 LIFT Safety Ni-Flex Gloves (Black, Small) by LIFT Safety at Two Wheel Tek. MPN: GNX-1KS. Hurry! Limited time offer. Offer valid only while supplies last. GNX-1KS Size: Small Features: -Gloves. -Ideal for working with solvents, nitrile is chemical resistant and helps dissipate electrostatic charges. GNX-1KS Size: Small Features: -Gloves. -Ideal for working with solvents, nitrile is chemical resistant and helps dissipate electrostatic charges. -Powder free where contamination is a concern and contains no natural rubber proteins known to cause allergic reactions. -Lightweight and comfortable ni-flex offers improved performance, protection and durability. Use: -Work Gloves. Material: -Latex. Disposable: -Yes. Generic Dimensions: -Overall dimensions: 8.5" H x 5" W x 2.5" D.